It is patently absurd to believe that it is factually true that “the universe” is a very large and rather static physical object shaped somewhat like a funnel, which began with a singularity occurring 13.74 billion years ago. 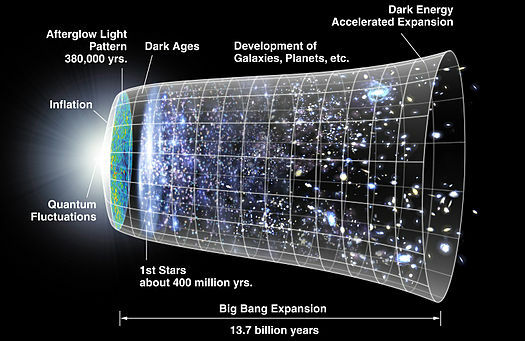 The Big Bang model of the universe has no basis in fact. The theory of Black Holes is a mathematical construct only. Both the Big Bang and Black Holes are based on questionable theoretical modeling and are supported solely by paper and pencil mathematical computations (or, in more recent years, computer math). They and other similar cosmological fantasies are also supported by our unshakeable faith in the far-seeing ability of a handful of scientists who happen to be very good at telling interesting stories which capture the attention of the public. I will show that what we can see of the smear of the universe could actually be a mixture of organic and non-organic materials. Finally, I will demonstrate that the universe may actually be an ecological system where our solar system is simply an ecological niche. I will show that the universe as an ecological system is not capable of mathematical certainty, and therefore is indeterminate and subject to computational irreducibility. This is a long story. I guarantee it will be worth your while to follow the story to the end. What we are seeking here is an actual coherent explanation of what we know and what we don’t know about the “universe,” and a coherent view of our place in the “universe.” Perhaps in our quest for coherence, we should keep in mind the possibility that the universe, as well as the vast world within us and without us, remains a mystery. To the extent that we can look at our whole world as a mystery rather than as a solved scientific problem, we will make eventual progress in finding better and more fulfilling ways of living in our bodies, our world, and our universe. The excitement of the scientific stories of the “discovery” of the nature of the universe has spread around the world over the last hundred years. The Big Bang, Black Holes, the shrinking and expanding universe, objects about to collide with the earth: all these and many more speculative narratives have entered the consciousness of our time. These fictional accounts are now accepted as a fact by people who should certainly know better. Please let me make clear at the outset that in these comments I am not attacking anyone’s religious beliefs, nor am I describing these religious beliefs as fictional. The Old Testament, the New Testament, the Koran, the Bhagavad Gita and all the other foundational religious texts are what they are, and are worthy, and are based primarily on the faith one has in these ancient foundational texts. What I am saying is that the texts written primarily by Twentieth Century cosmological scientists are to a great extent fictional, and are written in such a way as to have some of the same attributes as religious texts, yet are not worthy of belief as revealed truth. They are based solely on assumptions, and require faith in order to be believed. At least Jules Verne had the integrity to declare that his novels such as “Journey to the Center of the Earth” were fictional. And when Orson Welles’ radio drama, “War of the Worlds,” in 1938 made millions of people actually believe that we were being invaded by Martians, at least the network had the integrity to follow up with heavy disclaimers about the truth of the show. It is absolutely necessary for us who are not a part of the initiated priesthood of science to accept the fabulous assertions of our cosmologists based entirely on faith, as there is no other basis for belief. The foundational stories of cosmology were written by such notables as the five cosmic theologians Albert Einstein, Werner Heisenberg, Edwin Hubble, Georges Lemaitre, and Stephen Hawking. For us to believe in the current cosmological description of the universe we must believe without question and with faith in these five men’s written texts, a Torah of science, and those of their minor prophets, who are many. These physicists are the authors of the new cosmological creation stories, and their narratives are largely intended to replace the prior religious creation stories contained in faith-based religious narratives. The writings of these and other scientists are intended to, or have the effect of being, analogous to the writings contained in the five books of the Torah: Genesis, Exodus, Leviticus, Numbers, and Deuteronomy. Everyone acknowledges that the writings of the Torah must be accepted on faith and without factual evidence to support them. Why is it that no one seems to recognize that the writings of the five above-named physicists and their minor prophets must also be accepted on faith and without factual evidence to support them? From Easton’s Dictionary, faith is in general the persuasion of the mind that a given statement is true. Its primary idea is trust. A thing is true, and therefore worthy of trust. It admits of many degrees up to full assurance of faith, in accordance with the evidence on which it rests. Faith is the result of teaching. Knowledge is an essential element in all faith, and is sometimes spoken of as an equivalent to faith. Yet the two are distinguished in this respect, that faith includes in it assent, which is an act of the will in addition to the act of the understanding. Assent to the truth is of the essence of faith, and the ultimate ground on which our assent to any revealed truth rests is the veracity of the source of the faith. How do our cosmological physicists of the last hundred years get away with claiming infallibility and dodge the question of faith as a precondition for believing their narratives? First of all, they claim that each of their assertions is entirely based on facts, and as such we must accept the truth. The problem here is that their “factual analyses” are so complex and obscure that only a very few select people can understand them, so everybody in the common population must simply accept that the facts are there. And the truth is: the facts are not there. This position is not so very unlike the position of the medieval European priesthood. Only a few selected scholars knew Latin, the Bible and all Biblical analysis was in Latin, and all masses and other services were conducted in Latin. Therefore the common people, which meant nearly everyone, were required to rely entirely on the priests and the scholars for an understanding and interpretations of the Christian faith. I don’t know about you, but this seems to me to have been a very unsatisfactory situation, especially since I’m one of the “common people.” Even with my considerable education, I know only a few Latin phrases, such as res ipsa loquitur. The modern cosmological scientists are therefore claiming much of the same ground as these medieval priests. So we must agree, on faith, that the narrative stories of these cosmologists are true. Such an act of faith requires us common people to exercise our will to come to a place of agreement with these cosmologists. We must willingly assent and choose to believe, even without understanding the essence of what we are choosing to believe in. The ultimate ground on which our assent to any revealed truth rests is the veracity of the source of the faith. Are we as a people willing to blindly accept on faith the veracity of Albert Einstein, Werner Heisenberg, Edwin Hubble, Georges Lemaitre, Stephen Hawking and their followers, and their very obscure computations and suspect “observations?” We really don’t know these men, or their followers, and we don’t know what was or is in their heart of hearts. We do know that Albert Einstein was a man of noble intentions, yet even he may have inserted some extraneous factors into his Special Theory of Relativity equations to make them balance. I’m certainly not suggesting any conspiracy among scientists. I expect that they were good guys who were doing the best they could with what they had in front of them. None were deliberately trying to generate a false cosmology. It’s just that one thing got piled onto another, as things tend to do in everyday life as well as in the hallowed halls of scholarship. Another source of our faith in these cosmological scientists is the award to many of them of the Nobel Prize in physics. If the work receives a Nobel Prize, it must be true. Just remember, though, that the Nobel prizes are generally awarded based on a consensus of scientists who are in the same field. Each of these scientists has a vested interest in preserving the current narrative. Thousands of men and women are frantically publishing academic papers confirming and extending the current narrative. This is just what scientists do. No one should make them out to be either good or bad for doing what they normally do, even if they’re getting it wrong some of the time. Another source of our faith in these cosmological scientists is that their creation and history of the universe stories are peppered with observations and experiments which they say demonstrate that the facts they are writing about are true. They tell us in a facile way that the computations on which their stories are based are so complex and obscure that we normal people couldn’t possibly understand them. But the observations, experiments, and calculations are there, take our word for it, they say. 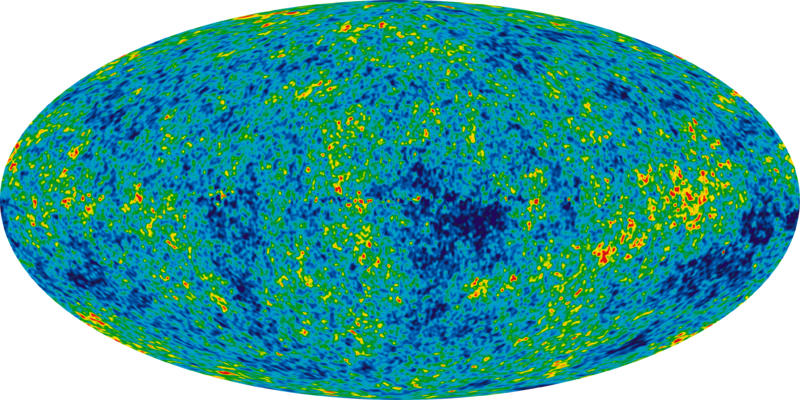 The “cosmic microwave background radiation” shown above is considered by cosmological scientists to be actual evidence and proof of the Big Bang, not subject to interpretation; and looking at it, scientists in the know see the origins of the universe. Hmmm…. All we see when we commoners look at it is a gooey mash-up of irregular forms. We are assured by the storytellers that each of the tiny configurations in this picture contains hard evidence of the Big Bang. Is their heartfelt assurance worthy of our belief? When I look at that picture I see a brightly decorated and slightly deflated beach ball. This is part one of a series. As the series progresses we’ll look at more supposed proofs of the veracity of the cosmological scientists. Particular emphasis will be given to the known qualities of light. Then I will propose one or more alternate descriptions of the universe outside our solar system, descriptions which are just as likely as those of the current creation scientists. Much of this analysis is based on original research done by my daughter Michelle Kathryn McGee. You can visit her site at http://healinggeneration.com/oneness.html She does not vouch for the accuracy of what I am writing; any mistakes or misstatements are entirely my own. In this blog entry I intend to examine the stories created in the imagination of scientists to explain the creation and massive size of the universe. I’ve tried to make the story as entertaining as possible, while adhering closely to scientific fact and the scientific method. I am not a scientist, yet I’ve studied science all my life, throughout my career as a lawyer and in the last few years since I have given up the practice of law. Even though not a scientist, I am an expert, from thirty years of law practice, in analyzing evidence and developing proof of a disputed principle or point from a given set of facts. I bring this well-developed strength to my analysis. As a young man I was a student of science and among other things an avid observer of the stars. My uncle Gilbert Henry was a professor of astronomy and I spent time with him occasionally. Much of my knowledge of astronomy, though, came from my grandmother, who during many hours of my childhood taught me about the universe, most of which information she’d learned over the years from her son Gilbert. So I’m not entirely ignorant of the science of astronomy and cosmology. Here I will develop proof of my thesis that the concept of cosmological space is a product of the use of flawed methods of science. The cosmological story of the creation of the universe 13.77 billion years ago by the Big Bang, and the stages through which the universe has passed from then until now, is purely a myth, with no more provable validity than the Biblical creation myth, or the Asian myth of the earth being supported on the back of a giant turtle. Let me show you how this is so. Throughout history people have looked up at the stars and wondered what was out there. By the nineteenth century we understood that we lived in a starry universe filled with bright objects which seemed to be very far away from us. It was not until after Albert Einstein presented his general theory of relativity in1916 that scientists began to claim that it was possible to know everything about the universe we live in. Thus began the scientific myth of far sight. The myth of far sight generated an incredible amount of scientific activity after 1916. Since that time scientists have come to believe that we now understand the mysteries of the deep universe and the details of the origins of the universe. Many of these details are embodied in the Big Bang Theory, and in the related concept of Black Holes. Most people are now convinced of the truth of these two concepts, which arise from the fevered imagination of scientists who truly believe it is possible to know everything. People want to believe we can see all the way back to the beginning of the universe, and know its most intimate workings. Scientists are more than willing to provide us with a myth which will give us what our own fevered imaginations want. Human consciousness must have its delusions, superstitions and creation myths. Cosmological scientists have since 1916 planted and perpetuated a set of delusions and given them the credibility of Science. These new delusions are almost universally accepted as the Holy Grail of Science: an answer to the ultimate questions about space and time. It is a huge intellectual arrogance for us to believe that right now we know everything about the universe; what mankind has wanted to know for thousands of years is now laid out before us in perfect order and symmetry. Woe be unto him who challenges in any particular the flawless descriptions of the whole universe handed down to us from on high by the Scientists! It’s too bad the recently developed scientific narratives of the origins and dynamics of the whole universe are not true. They make a good story. L. Ron Hubbard’s development from about 1950-1980 of a religious description of the space creatures that populated and still control all but a few of the elite of the earth is a narrative which is accepted by Scientologists as true. It also makes a good story: told by a novelist. Each of these stories, Cosmological Science and Scientology, give us a sense of certainty in a time when people feel overwhelmed by the chaos of daily life and fearful of the unknown. The current cosmological scientific myth says that the universe is about 13.77 billion years old, which is a very precise measurement of distant time. The framework for the Big Bang model relies on Albert Einstein‘s general theory of relativity, which was delivered by him in 1916. The Russian Physicist Alexander Friedmann in 1922, and the Belgian Georges Lemaître independently in 1927, introduced mathematical equations from Einstein’s general relativity which claimed to support the concept of an expanding universe that contained moving matter. In 1929, Edwin Hubble announced that he had “discovered” that the distances to far away outer space galaxies are generally proportional to their redshifts— an idea originally suggested by Lemaître in 1927. Hubble’s observation was taken to indicate that all very distant galaxies and clusters have an apparent velocity directly away from our vantage point: the farther away, the higher the apparent velocity. Hubble’s “observations” were made by looking at a meter on a very earthbound instrument which was invented for the stated purpose of measuring redshift. For all we know the instrument could be measuring the number of red lights on the streets of a nearby town. We must take it on faith that the instrument is “measuring signals from deep space.” Yet the Big Bang and other theories of the construction of outer space depend on these measurements. Hubble’s theory contains too many genuinely unreliable and un-measurable elements, and therefore his theory is unreliable, and therefore distances determined in this manner are all nonsense. For one thing, the red end of the light spectrum, as it exists in its only measurable form here on earth using very earth-bound instruments, has only a certain limited number of different frequencies before it resolves into another color on the spectrum. In order to determine that one speck of light is 10 billion years old and another is 500 million years old, we would have to measure an almost infinite gradation of frequencies of red light. The task of measuring such minuscule gradations is certainly not within the capacity of our instruments even now, much less in the 1920’s in the time of Hubble. Yet we are so ready to speculate, based on the flimsiest and most unreliable of mythical data. 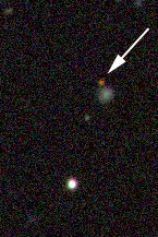 Again from the NASA site, the red speck indicated above is a telescope image which scientists have interpreted as being a powerful quasar estimated to be over 100 times brighter than a galaxy. The “quasar” appears faint because it is said to be extremely distant. Its distance has been indirectly gauged by noting how much of the light it emits has been red shifted to longer wavelengths “by the expansion of the Universe.” Yes, this speck of light is visibly redder than the other specks of light in the picture. So do we really know it’s far away? What’s the claimed distance to this quasar? Scientists say that this little red quasar is more than 12 billion light-years away. If we believe this little red riding hood fairy tale, then the little speck has been rocketing through space for 12 billion years without undergoing any modification or distortion of any kind whatsoever. The explanation of the meaning of the red shift in the above picture is entirely delusional. What is actually visible in the picture is a speck of light of a slightly different color than the other specks of light in the picture. Sitting here on earth, all we can know is that there is a “speck.” The speck could be there because someone forgot to polish the lens on the telescope before the picture was taken. Even if the speck does come from beyond our solar system, we don’t even know if the speck actually represents an “object.” It could be pure light, coming from any distance. And how can we know if the speck is naturally red, like the red planet Mars; the scientists say with certainty that the speck had another color a long time ago, and that color changed to red over a period of billions of years. I’m sorry, you well-meaning cosmologists. I know you are believers in the scientific myth of far sight. I’m not trying to make fun of you. Quite the opposite: I want you to take your scientific measurements and descriptions more seriously, rather than just blindly accepting the mythical constructs given to you by an earlier generation of dreamers and storytellers. Now let’s move to the most spectacular event which was invented by cosmologists during the twentieth century: the Big Bang. Based mostly on mathematical models, plus claims that really faint specks of light have been positively identified as being objects billions of years old, the authoritative, complete and seamless panoply of creation has been given to us by the “experts.” The ancients had Zeus and Mars and their other gods; we have the Big Bang. 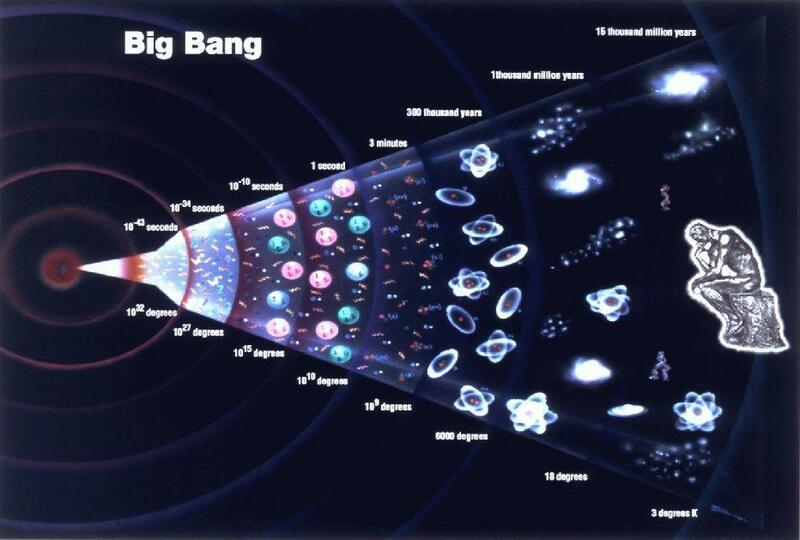 The Big Bang describes the universe as having begun as an infinitesimally small speck known as a singularity. The exact nature of this singularity, when where it originated, and why this particular singular particle was different from others, have not been described. Nevertheless, this singularity expanded. It had to be an incredibly pluripotent singularity, since it contained within itself all that was and all that is. At first it created a few elements, then as billions of years passed the singularity created all the elements, all the galaxies, all the stars, and all the trillions of tiny working parts and pieces of the earth and the human beings thereon. It is a true legend of creation, intended to explain where everything came from, so we won’t have to live in fear of the unknown and the unknowable. It’s about as entertaining as the stories told around the fire at night on a Scout camping trip, while marshmallows on sticks are toasting. It’s the incredible “expanding story” of the expanding universe, told to us by other campers, and believed to be true as long as the night is dark and there are strange sounds coming from the woods. The Big Bang theory depends on two major assumptions: the universality of physical laws, and the cosmological principle. These two principles state that no matter where you are in the universe, the universe is uniform, and that the same geometric principles govern the behavior of the universe locally as well as on large scales. These assumptions are entirely incapable of being proven, since the only place in the universe where we can make measurements is right here in this chair at this table on this planet. The assumptions rest solely on mathematical computations which were made up by mathematicians who want us to believe that mathematics is the answer to everything. So we have a lot of assumptions to make in order to believe in the Big Bang (or in Scientology). The religion of Scientology has a similar type of story, told to believers by a novelist who supposedly had the gift of far sight, L. Ron Hubbard. These religious believers maintain that Xenu was the ruler of a Galactic Confederacy 75 million years ago, which consisted of 26 stars and 76 planets. Xenu was about to be deposed from power, so he gathered billions of his citizens, then paralyzed them and froze them in a mixture of alcohol and glycol to capture their souls. The kidnapped populace was loaded into spacecraft for transport to the planet earth. The present population of the earth is descended from these souls. Here we have a fabulous story which many people believe with all their hearts is the truth about the ancient history of the earth. This story is just as believable as the creation myth which has been invented by cosmological scientists. Yet a much greater proportion of the population of the earth believes in the Big Bang creation myth developed in the name of Science by cosmologists. So, it’s time to create a new and more realistic narrative, a new story about man and his ability to gain knowledge of outer space, which will supplant the superstitions of the present and allow further material progress to move to the next level. The new narrative is that we cannot know what is happening outside of our solar system; which is as far as we can see or probe with any reliability. Further, we will likely never know (until some future technology provides for space travel) with any accuracy what is happening outside our solar system, no matter how hard we try. Lawrence Krauss, a cosmologist who recently published a book called A Universe from Nothing, implies that now, as of 2012, we know almost as much as we will ever know about our universe. In his afterword the well-known scientist Richard Dawkins is absolutely ecstatic: we live at a privileged singular point in time where we know the universe better than anyone has or ever will know it! This sort of overpowering sense of superiority and infallibility on the part of scientists such as these two can get in the way of unmasking the delusional belief systems such as the Big Bang, which are propagated by these and many other scientists. It is of no consequence whether these scientists believe in God or not, which they don’t. What is of consequence is that they have created out of whole cloth a new creation myth which is no more capable of proof than the Biblical creation myth. They want to be the proprietors of this new Big Bang creation myth, which is every bit as fuzzy and mystical as the Biblical and other world-wide creation myths they propose to supplant. In their true belief in their intellectual superiority they have become the authors of the new Bible, which contains their description of outer space and the origin of humanity as being the received truth. Their version of the creation myth is ultimately a completely materialistic explanation of how we got to be who we are in the here and now. It’s a wonder how they can even include thought or feeling in their narrative of creation. Neither thoughts nor feelings are in any way material in nature. You can’t touch or quantify either of these attributes of humanity. Further, they use mathematics to prove their materialistic theories. Yet mathematics itself is in any way material in nature. Math is abstraction based on thought. You can’t touch or quantify the abstract qualities of mathematics. Putting the symbols on a piece of paper is not the essence of math. Math is a form of thought. So these scientists are using abstract concepts, and thoughts which are not capable of being quantified, to attempt to prove a wholly material concept of the origin of the world and to explain the presence of humanity here where we are today. So am I the only one who sees a contradiction in the reasoning process here? Even though they will deny it with vigor, Krauss and Dawkins have the same need as the rest of humanity to have a Received Truth to live by. Their imagined version of creation is for them a miraculous substitute for the psychological need for religious belief we are all born to. They need a miraculous and far-reaching story of creation just as most of us do. They need to believe. We need to believe. The need for belief is one of the foundations of the human experience. Belief is really all we have. Without belief all we have is the chaos and fear and ambiguity of daily existence, which for them and for most of us is an intolerable situation, fraught with dread and anxiety. In Part Two of this blog I’m going to tell you some things about science which you will find hard to believe. It’s going to be fairly dramatic, so make sure you don’t miss it.